Celebrating the life of Clifford "Poppy" Vogle, Sr.
Obituary for Clifford "Poppy" Vogle, Sr.
Clifford “Poppy” Vogle, Sr. of Success, MS passed away at his home on November 14, 2018. He was preceded in death by his wife; Barbara Vogle, his parents; Homer and Catherine Vogle and three siblings; Gobbler Vogle, Tiny Vogle and Hunbaby Vogle. He is survived by his four children; Dawn (Arthur) Tohill of Success, Robert “AL” (Sundee) Anspach of Success, Dutch (Denise) Vogle of Success, Neecee (Tommy) Butler of Success, eight grandchildren and a numerous amount of many other children. Interment will be held at Clifford Vogle Cemetery immediately following the service. To send flowers or a remembrance gift to the family of Clifford "Poppy" Vogle, Sr., please visit our Tribute Store. 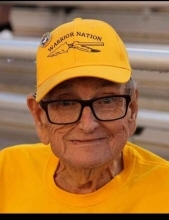 "Email Address" would like to share the life celebration of Clifford "Poppy" Vogle, Sr.. Click on the "link" to go to share a favorite memory or leave a condolence message for the family.